Invented by a computer lab teacher, the elegant Desktop Space Bar gives you a sleek, stylish, storage solution, plus six additional USB ports. 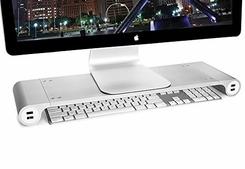 It holds your monitor off the desktop so you can slide your keyboard below. It also creates shelf space to hold other items, like keys, phone or a digital camera. Stores a keyboard (up to 18" x 1.5") and supports a monitor up to 30.5 lbs. (a 27" Apple iMac).